I don’t know about you, but I never used to think much about what I slept on, despite the fact that I’ve had trouble sleeping my whole life. Then, a few months ago, I discovered that synthetic fabrics such as the extremely popular and commonly used polyester are treated with toxic chemicals like formaldehyde. For those of you who don’t know, Formaldehyde is recognized as a known carcinogen. I was baffled. But this stuff was in my bedding. On my clothes. Used to stuff my pillows. In my mattress! The synthetic fibers used in mattress manufacturing, such as polyester (which is actually a form of plastic) are not only toxic, but they make your mattress much less durable. 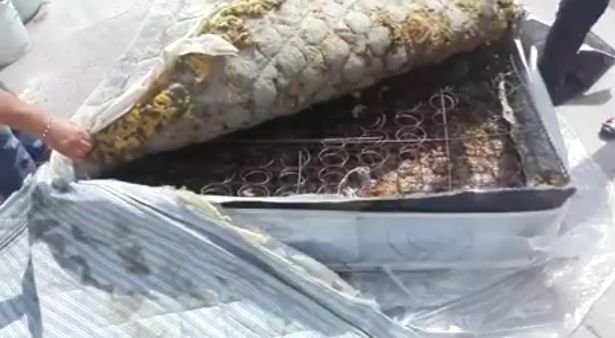 This is why it’s recommended to replace your mattress every 10 years. What if I told you that you could get an organic, toxin-free mattress that lasts 20 years or longer? Win-win, right? Let’s check it out. Before we jump into organic mattresses, it’s important to know what chemicals are used in your current mattress that could be making your environment toxic—this includes your sleep, your bedroom, even your entire home! Numerous materials go into conventional mattress making. While the springs are made from wire and netting, the cushion of the mattress itself is generally the mix of natural materials combined with synthetic materials, including polyurethane foam and polyester fiber. A synthetic resin (basically a plastic material) that gives off vapors that can be inhaled or affect the skin. This is most commonly used in the foam layer of the mattress. The Environmental Protection Agency (EPA) put out a report last year on the flame retardants used in polyurethane foam. The report claims that these chemicals have been questioned as carcinogens and certain states—including New York, Maryland, and California—currently have bans and regulations in place for the use of these flame retardants in consumer products, including polyurethane foam. Also, a synthetic resin that happens to be highly flammable, meaning it needs to be treated with a flame retardant even to be used in a product. The EPA acknowledges that these chemicals have been shown to be hazardous to people and animals. Oh, and did you know that polyester is made from oil and gas? In order to bind all the layers of the mattress together, from the springs to the foam layer to the cushioning, adhesive is used. This could be glue or tape and is generally filled with toxic materials. These materials include asbestos, which has been linked to lung disease and lung cancer, and benzene, which is a known human carcinogen. Benzene is also commonly used in the foam layer of the mattress as well. Although your body may not touch these chemicals, most of them emit gasses that we breathe or can come into contact with our skin. Well! I’ve seen enough. How about you? 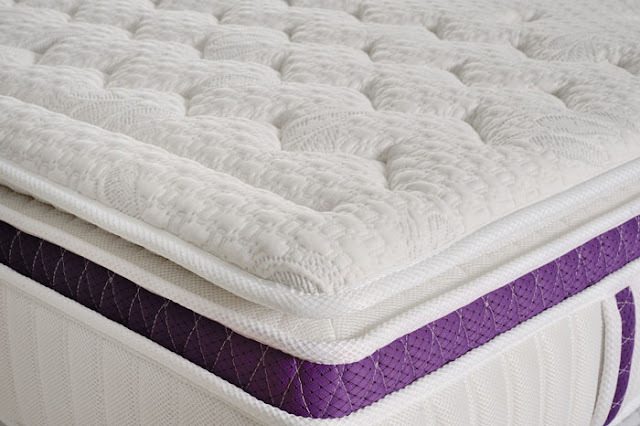 Let’s learn what materials are used in organic mattresses as opposed to conventional ones. So if an organic mattress isn’t made of polyester, polyurethane, and carcinogenic chemicals, what the heck do they use to make it? There are a few natural materials used to construct an organic mattress. These include organic cotton, wool, and natural latex for the foam layer. Latex foam is manufactured from tree sap and tends to be pricey, which is why synthetic or blended versions are used worldwide. It’s important always to question the claims of these manufacturers, and the ones who can’t answer your questions shouldn’t make the cut. Always ask about each layer and the materials used in the layer. Ask what type of adhesive binds the layers together. Question claims of “eco-friendly,” “non-toxic,” or “natural”—because chances are they are just claims. Look for certified organic—this means that the cotton hasn’t been treated with synthetic insecticides (which is often the case with cotton) or other chemicals. Certified organic wool will also ensure the sheep that the wool came from are healthy. If you’re vegan, you’ll want to find a mattress with purely cotton filling rather than wool. The Environmental Working Group (EWG) also recommends looking for the Global Organic Textile Standard (GOTS). This means the mattress can be labeled “organic” but may not have the USDA Certified Organic Label. However, a GOTS label means that at least 70% of the fibers are organically grown and the remaining 30% are prohibited from using polyurethane and other toxic chemicals such as adhesives made with hazardous chemicals and flame retardants. Oh, and if you’re wondering about all the flame retardant stuff, you have those people who fell asleep in bed smoking cigarettes to thank. Oh, cigarettes! Don’t they just make the world a better place? There are a few things to consider when it comes to organic mattresses. Second, you’re going to need to replace your conventional mattress every 10 years. Since natural latex is the densest and durable support layer for a mattress, your organic mattress should last 20-40 years or even longer. Why spend roughly the same amount of money on a mattress that’ll be totally worthless in 10 years when you could have a totally boss mattress for at least double that time? Third, although the Federal Trade Commission might not think so, not being exposed to these chemicals is a good thing. Some people get mad when natural companies make marketing claims like “chemical-free” or “all-natural” which just aren’t true—the truth is that everything is made out of chemicals! The word “chemical” has gotten a bad rap, but let’s not forget there are some good ones out there. So although you definitely want to research these claims and question the company, you also want to ask yourself—is sleeping on toxic chemicals good for me? Or do I want something that will promote my health and not ruin it? Research doesn’t quite back up the organic mattress fad yet—but we don’t necessarily need research to tell us that carcinogenic chemicals just aren’t healthy to sleep on or breathe in. There are many organic mattress companies, including Naturepedic, Essentia, and Soaring Heart. There’s no end to these companies! The price? Well, Soaring Heart’s Organic Latex mattress is $2,399 for a Queen size with a 20-year warranty while Serta’s ProEnergy Super Pillow Top Elite comes in at $1,449. The difference? A 10-year warranty for Serta and a ton of toxic chemicals. Organic mattresses are more expensive—but what’s your sleep worth? What’s your health worth? A good investment isn’t just about money or a better warranty. It’s about investing in a safe, healthy environment for your home and your planet in addition to your health. As for me, I haven’t made the switch yet, although I did get rid of all my polyester sheets and bedding to switch to organic cotton bedding. I’m about ready for an organic mattress, though!